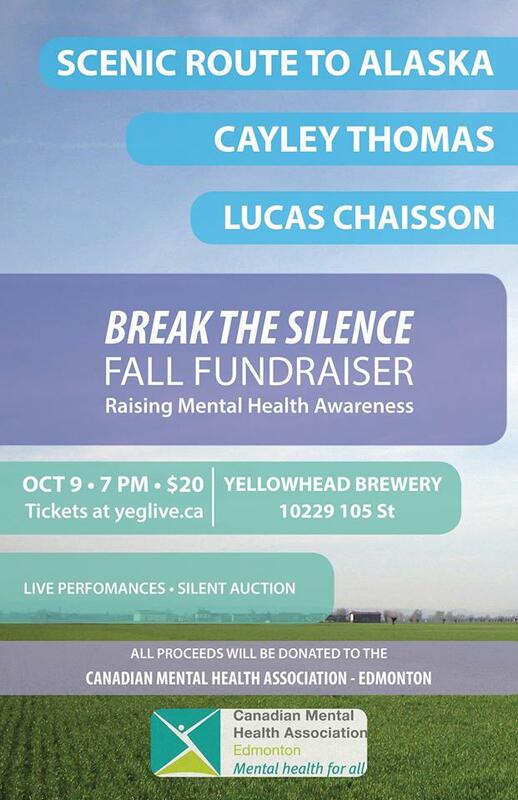 Scenic Route to Alaska, Cayley Thomas, & Lucas Chaisson will be performing at Yellowhead Brewery tomorrow evening, Thursday October 9th. $20 cover for three great bands? STRAIGHT TO THE CMHA! Highest bids on Incredible auction items? STRAIGHT TO THE CMHA! $2 from every beer? STRAIGHT TO THE CMHA! AND – if you download Scenic Route to Alaska’s new tune, “Fall” – you guess it – the proceeds go STRAIGHT TO THE CMHA! Just go right here! Speaking of links, get your tickets here! Raising awareness and support for mental health in Edmonton has never been easier, more fun, or more important. This entry was posted on 2014/10/08 at 10:18 and is filed under Edmonton Music Scene. You can subscribe via RSS 2.0 feed to this post's comments.